Today and yesterday: a tale of two seasons! Yesterday it was seriously summer, and today it’s woefully winter. It’s dark, it’s gloomy and it is raining like it’s going out of fashion. I am quite a soggy doggy by the time I weigh in at Weight Watchers where I gain a whole 600 grams – the weigh in lady kindly says it must be the wet bits weighing me down! There’s only a week before holidays (hurrah!) so my shopping list is so small I can go it alone today I pop in to Woolies after the weigh in. Another thing to cross off my list! I go home, unpack the provisions and then David and I head off into the city to pick up my new Nike trainers. 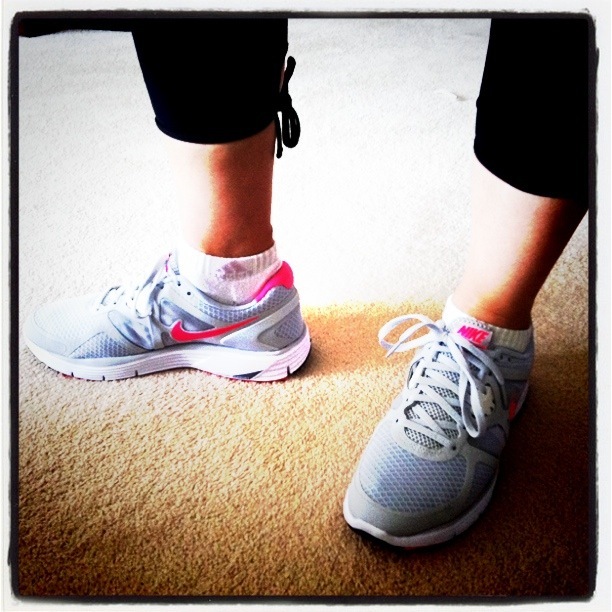 I am so excited – anyone would think I had never owned a pair of trainers before! Oooh, I could crush a grape! You see, these trainers are a bit extra-spesh as they’re part of the She Runs the Night package – there’s a singlet too, but that will come later. So today, in the middle of the mall, Nike have set up a faux mini-running field with two treadmills and before I get my filthy little mits on my new footwear, I’m going to get a foot assessment! A very nice man sits me down and asks me to run for a minute on the treadmill so he can see how I run, and which shoe is the best fit for my foot. I have to take off my shoes and socks and as I do, I really wish I had gone for a pedicure. My dino feet are so scary they should be R rated! Anyway, it’s pretty cool, he watches and makes a mini movie of, my minute run and then shows me my running style in slow mo on his funky ipad! He approves of the shoes I’ve chosen and lets me try them on for size before sending me into the store proper, to choose my colour! It’s a tough choice but I finally settle on grey and pink! Oh my word, I’m in sneaker heaven! I’m like the cat who drank the dairy dry! We pop into the department store on the pretence of buying a baking dish, but come out with another cookbook and no bakeware! Books in Australia are ridiculously expensive and I usually buy mine at the brilliant Book Depository but they don’t have this book in stock. Ironically, I have been looking for Donna Hay’s Instant Cook for ages, and today, it’s in store and on sale! I fell in love with this book when I borrowed it from the library and would you believe today’s the day for it to be returned! How fortuitous! This is an egg-cellent gift from David in lieu of an Easter egg, and is the cherry on the cake of my Donna Hay cookery book collection! We walk home from the library and try a fab new cafe for breakfast where we feast on great coffee, artisan sourdough bread and eggs so fresh, I swear they must have had chickens behind the counter! It’s too cold to hang around outside so we come home and get toasty. It’s cool outside but things are heating up in the kitchen! I’ve been wanting to make the delicious looking and sounding Vegetable and Sour Cream Frittata for about a month and finally, today’s the day! It’s going to make a sensational supper. It smells fab and makes Chateau Colden smell like a fresh food deli! David’s still a bit under par so I let him choose the cake that I’ll bake as a get well gesture. After perusing Donna Hay’s Modern Classics 2 he decides upon Marble Cake. Bummer! It’s a bundt tin recipe and I have bad bundt karma! Anyway, into the oven it goes with lots of crossing of fingers and hoping for the best! It comes out of the mould perfectly but it’s not marvellously marbled. David assures me that it what it lacks in marbling, it makes up for in taste.Now I am best friends with my bundt tin I can try out Sara’s brilliant bundt tin recipes at www.sewappetising.com Practice makes perfect isn’t that what they say? I just have time to create some Pumpkin Soup to pop into the freezer. This will keep me in lunches until I go on holiday and will tide me over when I’m home from hols. It’s healthy, warm and fabulously filling. It’s souper-bly satisfying! I think that’s quite enough for one day, so after a frittata feast and a lot of washing up, it’s time to rest my belly and watch some telly!